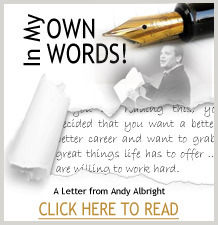 Make today the day you make a commitment and let Andy Albright change your life! Take The Albright Challenge and watch the results you produce in all areas of your life take off like a NASA space mission! You're about to go on the ride of your life, an adventure that will re-energize you with the desire to be, do and have all that life offers. Start thinking big because we are not here to play small! Carefully fill in each of the fields in the form below, check the box showing you agree to the term and conditions, then hit the Sign Up! button and you are ready to start the Challenge! You will immediately receive instructions with your next step. Congratulations on your decision! We look forward to helping you achieve all your dreams.